More than shuttlecocks will take flight when the Australian Badminton Open hits Sydney again this year, running from June 7-12, 2016. Badminton Australia has today announced that China’s XIAMENAIR is the new title sponsor of the XIAMENAIR Australian Badminton Open. The new sponsorship deal comes as Badminton Australia launch local representation for the tournament at the Jackie Chan Film Gallery in Shanghai today, February 1, 2016. The move into China will mark the first international launch for the Australian Badminton Open – Australia’s most prestigious badminton event. The Australian Badminton Open has been secured for Sydney by the NSW Government, through its tourism and major events agency, Destination NSW. NSW Minister for Trade, Tourism and Major Events and Minister for Sport, Stuart Ayres said the announcement will provide the Australian Badminton Open with an enormous boost. Loke Poh Wong, Badminton Australia’s Board member and Tournament Director said: “We’re thrilled to welcome XIAMENAIR as the new title sponsor for the event, and it’s particularly exciting when we are launching in China and focused on increasing attendance at the event from the world’s badminton powerhouse. The 2016 XIAMENAIR Australian Badminton Open Superseries will offer one of the most lucrative sporting prize pools in Australia, with US $750,000 up for grabs. It also gives athletes one of the last opportunities to earn the world ranking points needed to compete and improve their seeding at the Olympic Games in Rio in 2016. Broadcast into more than 200 million homes globally in 2015, the event will bring with it an influx of players, officials and supporters from not just around Australia but the world. XIAMENAIR started flying to Australia from November 30, 2015 – and is the first privately owned airline in China. Since it was founded the airline was honoured as “The Best Airline in Mainland China” six consecutive times, and has recently launched a new strategy “Fly High, Fly Far and Fly Outwards”. 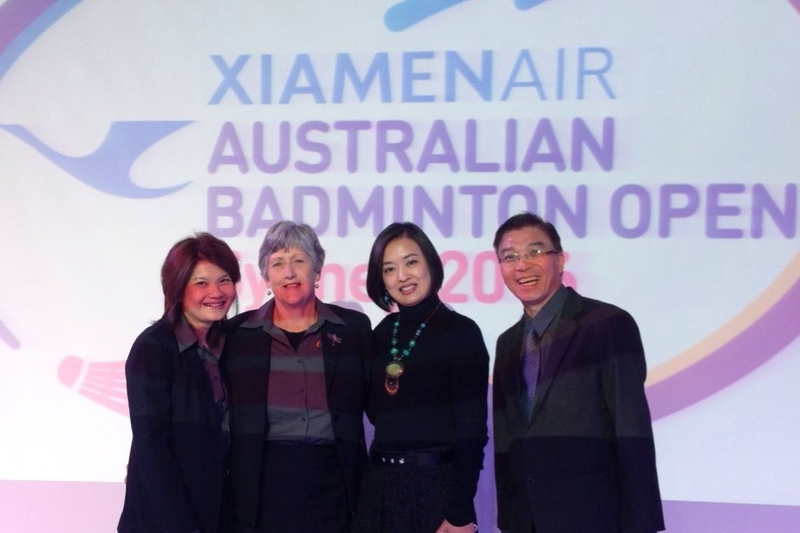 “XIAMENAIR’s Title Sponsorship of the Australia Badminton Open is very timely as we expanded our flight route to Sydney in November 2015. With the deployment of the newest Boeing Dreamliner planes with the excellence in inflight services, the new XIAMENAIR route to Sydney has proven to be successful and well received by customers in Australia and China. With the partnership with the Australian Badminton Open, we hope to continue our good work in fostering better relationships between Australia and China through sports and travel, and to further our commitment to support the growth of badminton globally,” said Mr Zhao Dong, Executive Vice President, XIAMENAIR. “XIAMEN fits so well with the ABO tournament. We’re excited about how this partnership, combined with the on the ground presence at the Jackie Chan Film Gallery, opens us up to China where the interest in badminton is phenomenal. There is already a lot of interest in our Australian tournament, and we attract the best of the Chinese player’s year on year. But with XIAMEN on-board, travelling to Sydney to see the tournament and all Sydney has to offer just got easier,” said Geraldine Brown, President, Badminton Australia.